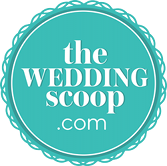 Finding a suitable wedding venue can sometimes take weeks or even months. 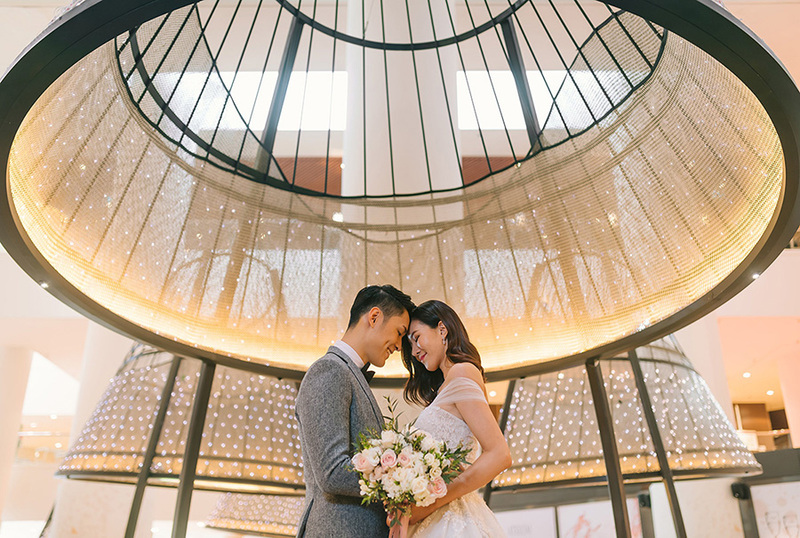 That’s why The Wedding Scoop has teamed up with Pan Pacific Singapore to help you in your planning process. 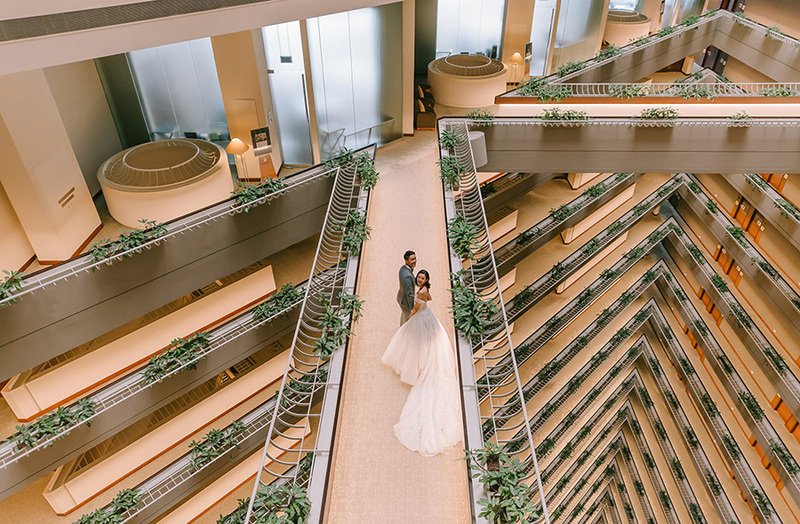 These stunning venues for your Big Day are great for intimate celebrations as well as larger-scale weddings. 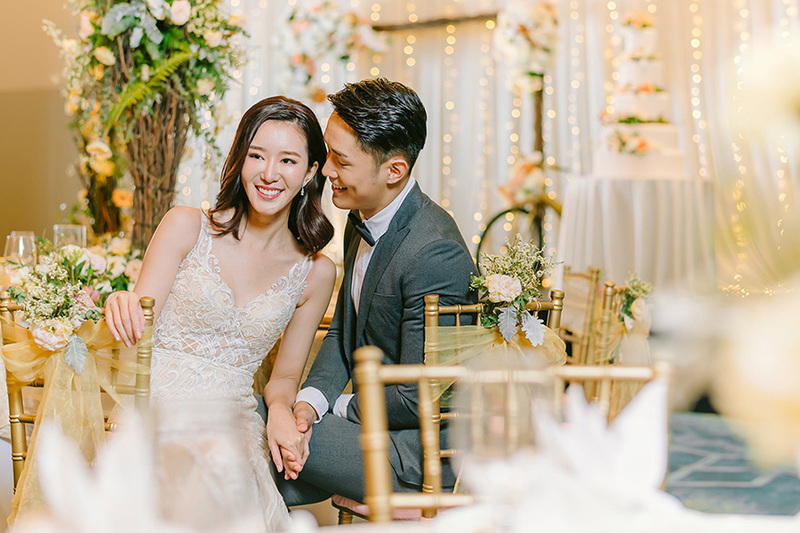 The venues which include garden, outdoor as well as indoor, ballroom, and more will be revealed at their upcoming wedding show on 27 April, Saturday, from 11am to 4pm. Keep reading to find out more about these photogenic spots! 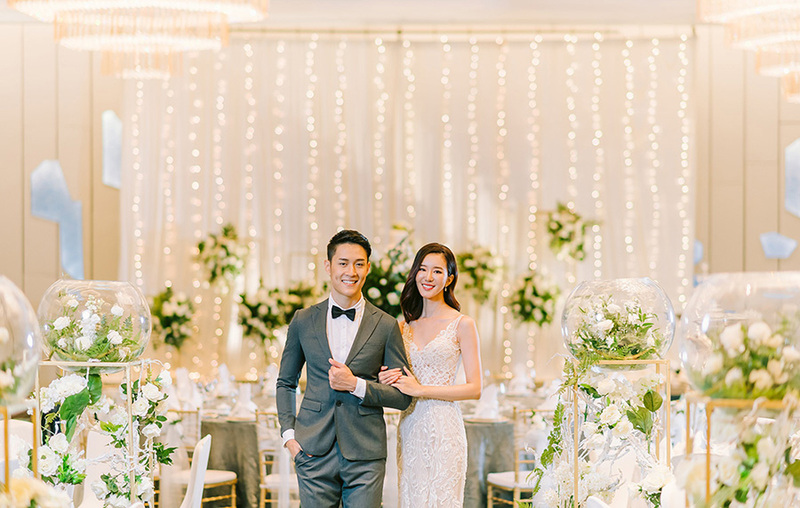 Singapore influencer Mongchin Yeoh (@mongabong): We held our wedding dinner in the Pacific Ballroom and the entire ambience was really nice. We loved the extremely long walk way that allowed the march-in to be paced slower, with the audience’s views unblocked. 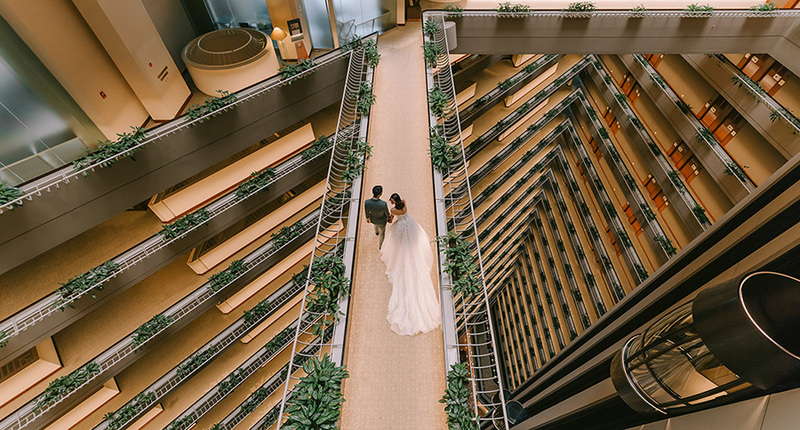 The food was splendid and our overall experience was so pleasant with the help of the Pan Pacific Singapore staff guiding us along the way at every step - from signing the package, to going for menu tastings, rehearsals, up until the actual day. 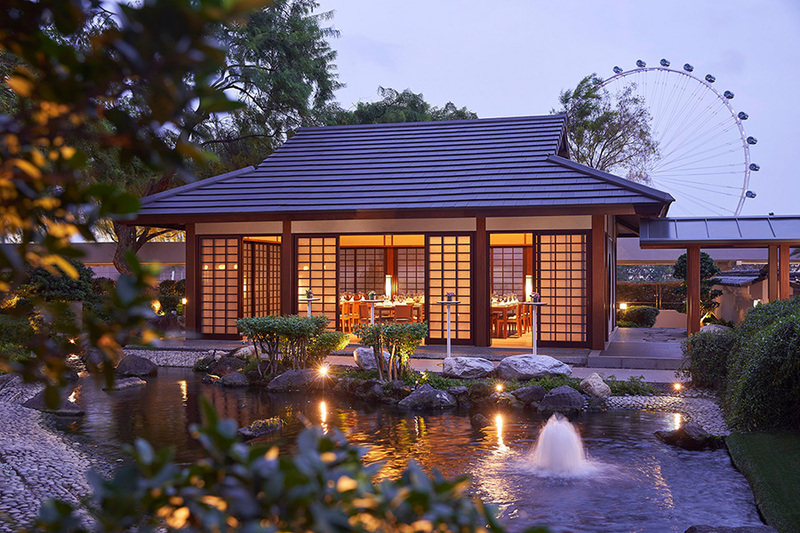 We highly recommend Pan Pacific Singapore! 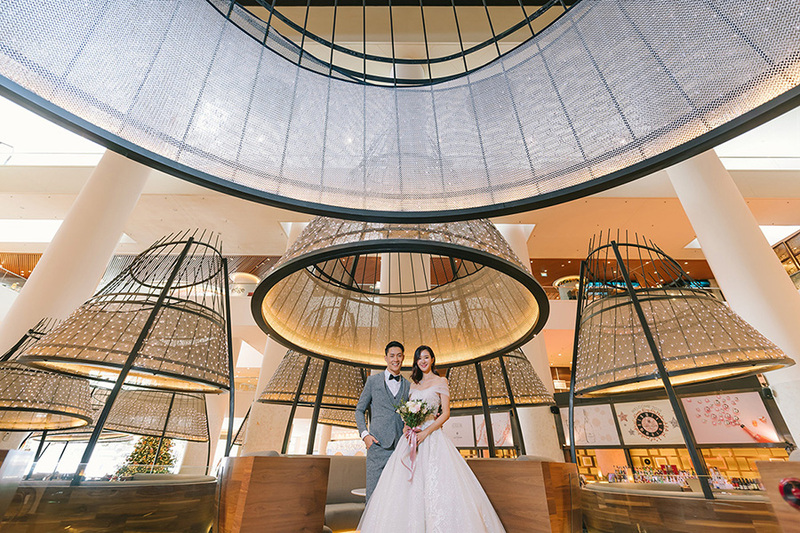 Oozing tranquil Zen vibes, Pan Pacific Singapore ’s Keyaki Garden Pavilion is perfect for solemnisations and small-scale weddings. 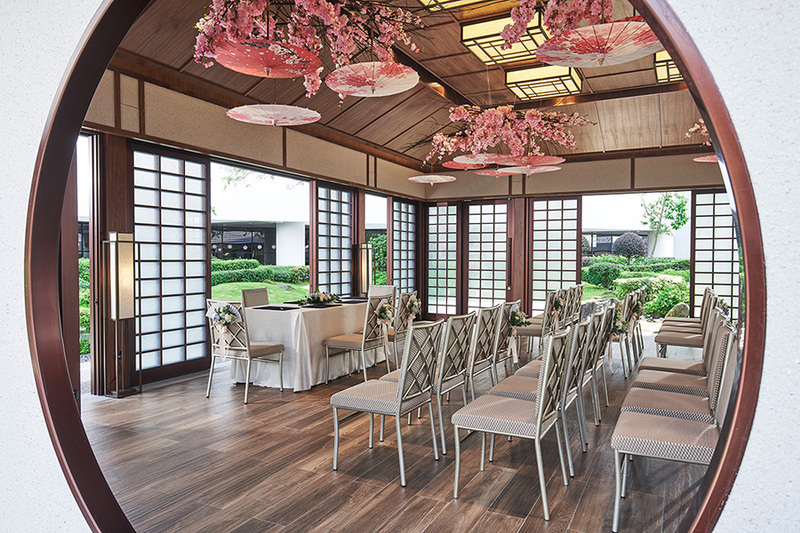 Recently built, it accommodates up to 40 guests for a sit-down lunch or dinner and features shoji-inspired screens that allow lots of natural light in. 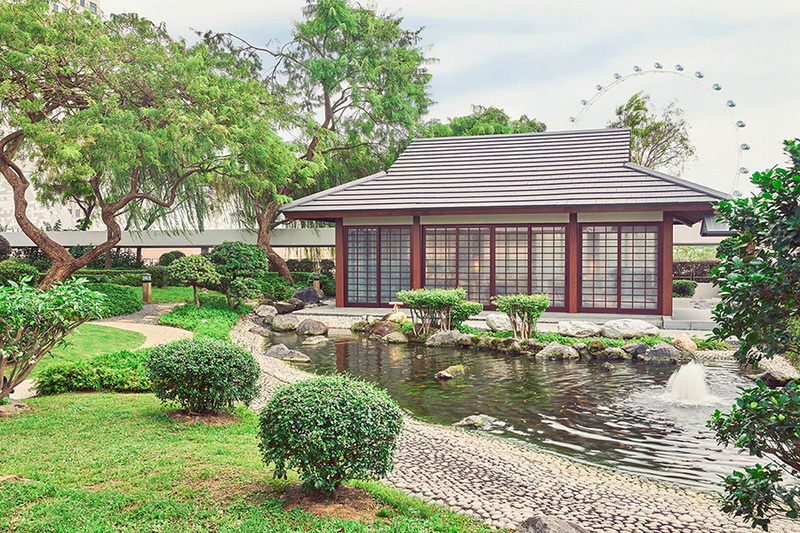 Surrounding it is a beautifully manicured Japanese garden and koi pond, which will serve as gorgeous backdrops for a couple photoshoot. 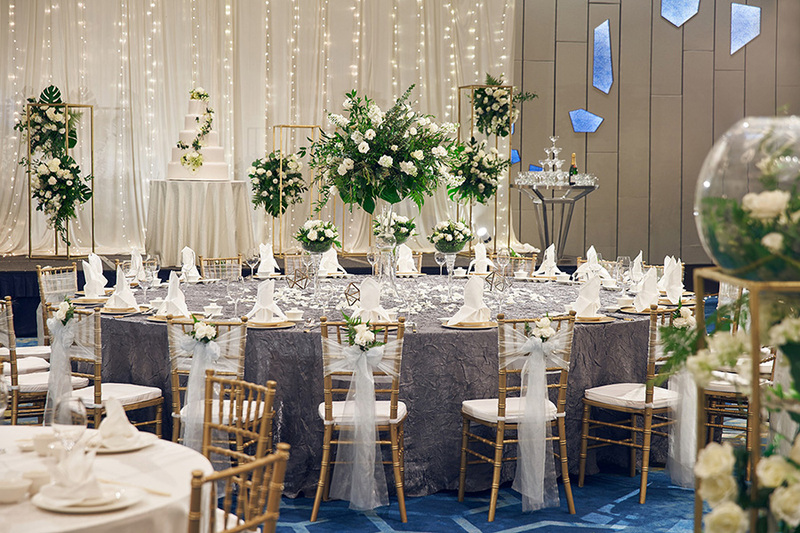 Another option for your solemnisation is the hotel’s Event Suites on Level 22, which has a capacity of up to 50 guests. 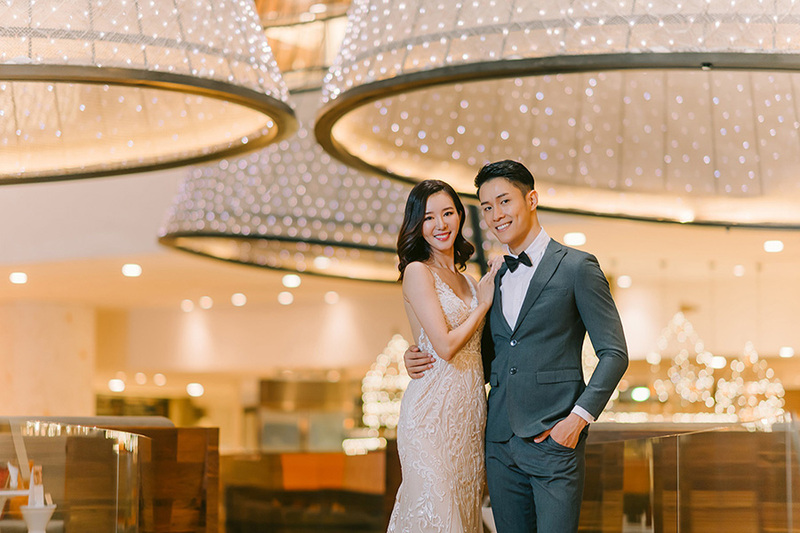 Featuring high ceilings, large glass windows and a private balcony with a breathtaking view of Marina Bay and the city skyline, the space is both functional and sophisticated. 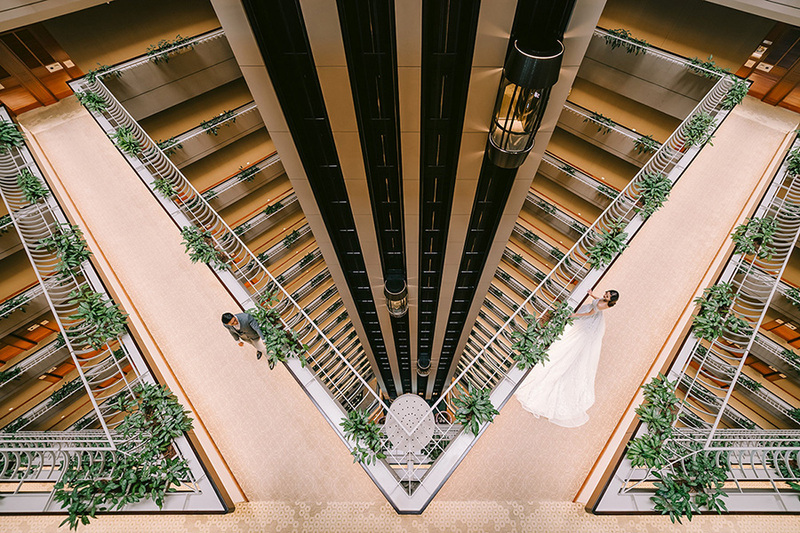 Plus, the hotel corridors leading to the Event Suites are a photographer’s dreams come true, and you can expect to take some awe-inspiring aerial shots here. 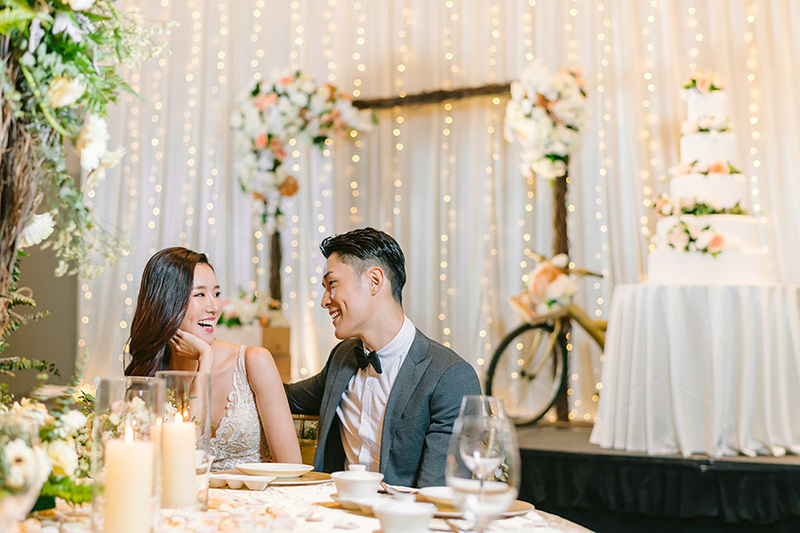 An outdoor solemnisation at Pan Pacific Singapore’s Poolside Patio is great for couples that are looking for a less formal venue. 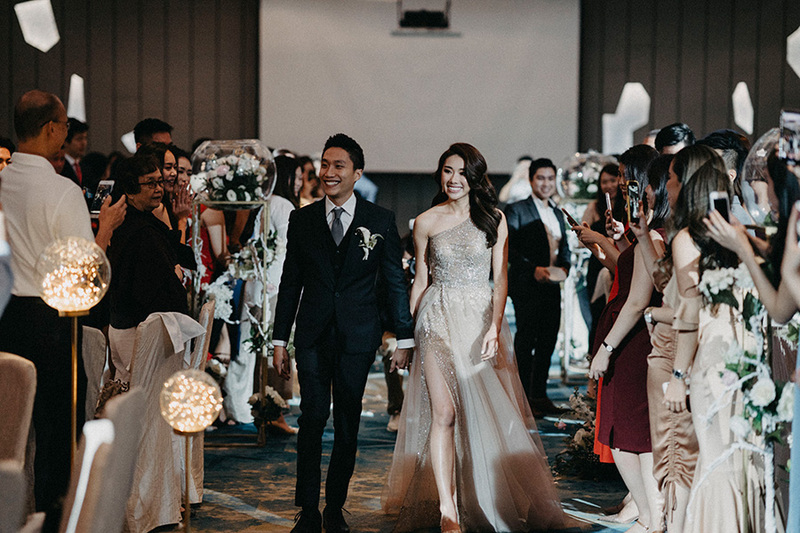 With a capacity of up to 170 guests, your dearest family and friends can enjoy refreshing cocktails and glasses of bubbly while you exchange your vows by the sparkling waters of the pool. 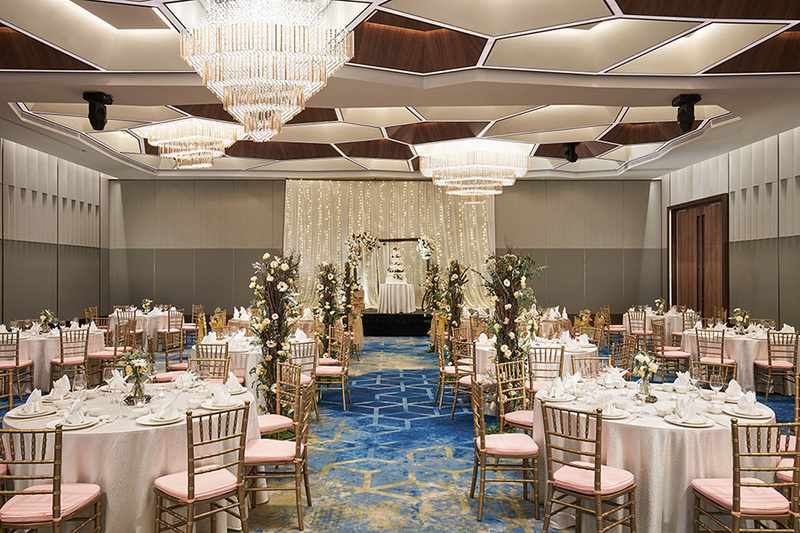 Big ballrooms conjure a sense of elegance and grandeur, and the Pacific Ballroom does all that and more. 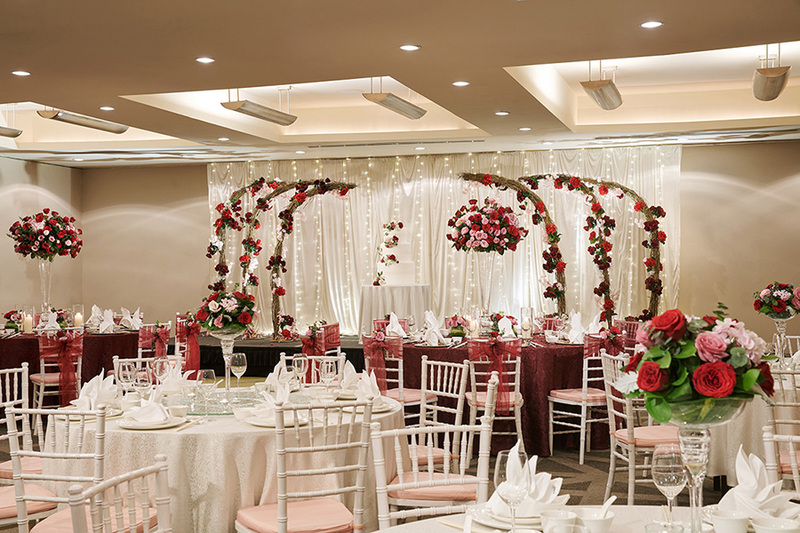 With its pillar-less layout, beautiful crystal drop chandeliers laid out in a honeycomb pattern and a lighting system that allows for changeable light colours, this ballroom is ideal for large weddings of up to 650 guests. 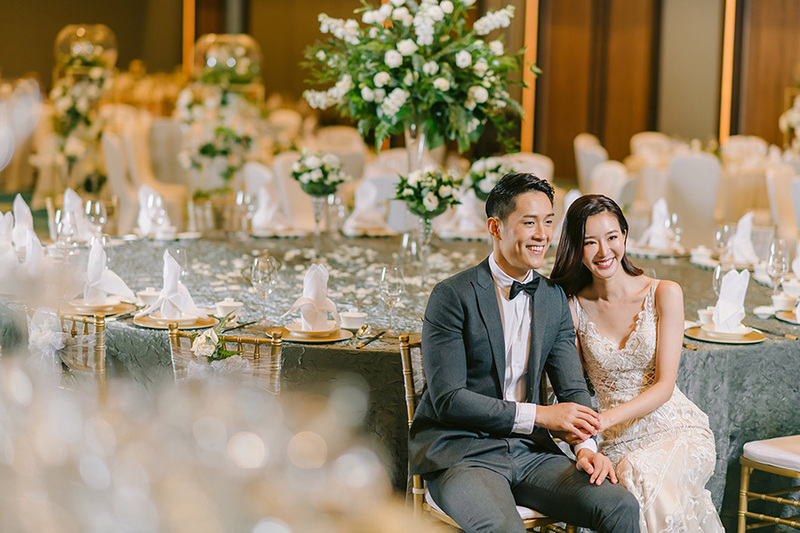 For couples that are keen on booking the Pacific Ballroom, the hotel also offers a range of new wedding themes for your happy occasion. 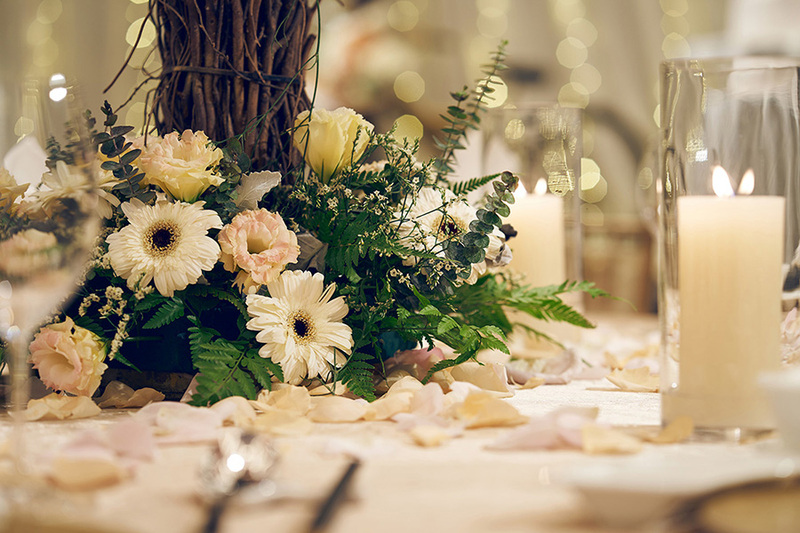 Enchante boasts a rustic feel, with delicate floral arrangements in dreamy pastel hues. 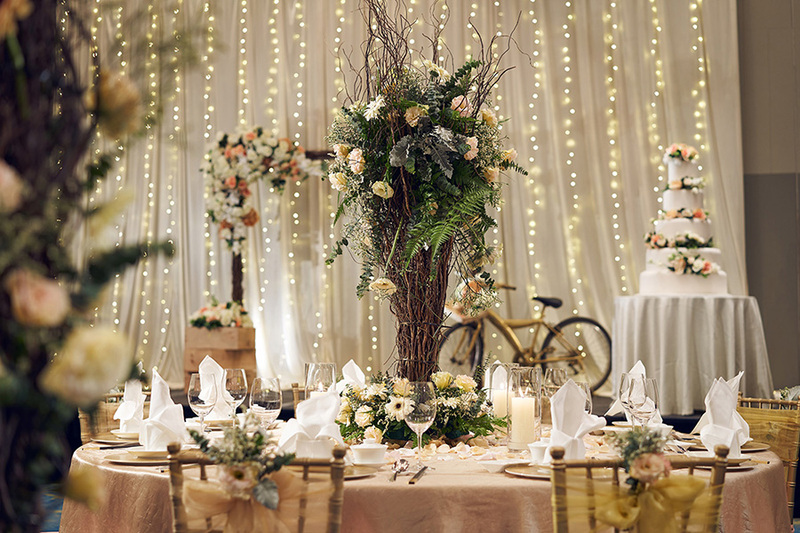 Natura, meanwhile, is a botanical-inspired theme that features an ivory-coloured backdrop embellished with fairy lights, with eucalyptus, Italian ruscus, eustomas and roses brightening up the space. 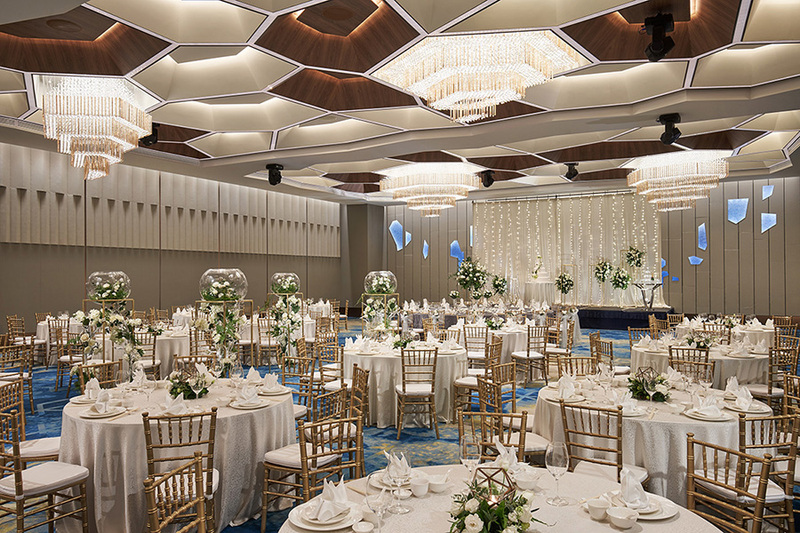 The Ocean Ballroom has a smaller capacity of up to 380 guests banquet-style, but it’s no less impressive. 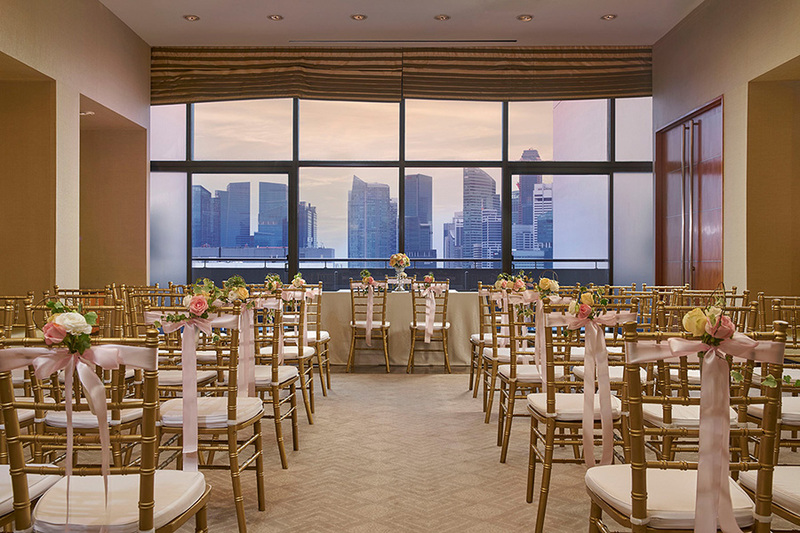 Decked in sycamore wood panels and clear glass panels, it’s a refined and classy space. 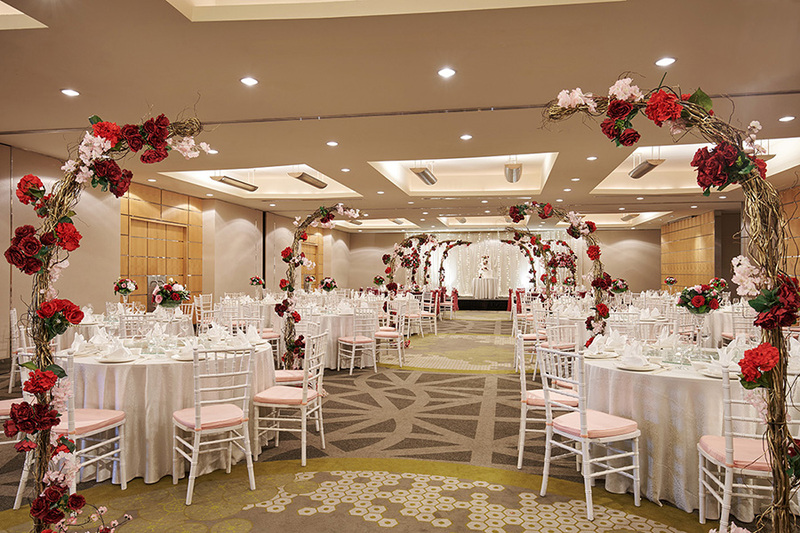 Plus, the hotel’s Scarlet wedding theme, which features cherry blossom arches along the march-in aisle and bold red and pink roses and eustomas, dramatically fills the space with romantic touches and complements the Ocean Ballroom perfectly. 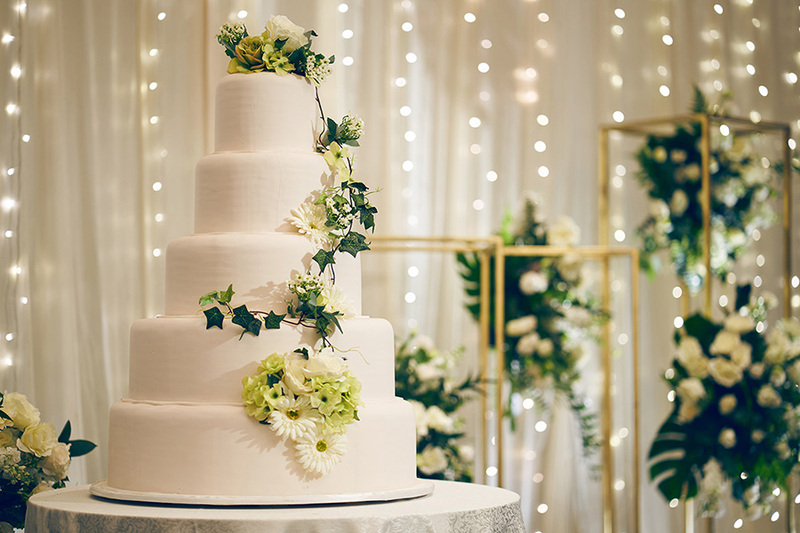 Good food is such an important part of a wedding. 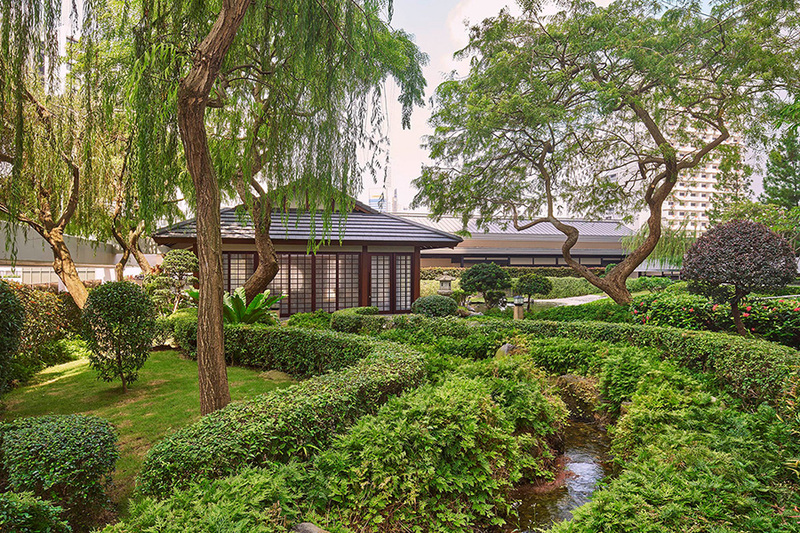 At award-winning Chinese restaurant Hai Tien Lo, you can be assured that your guests will leave feeling 100% satiated. 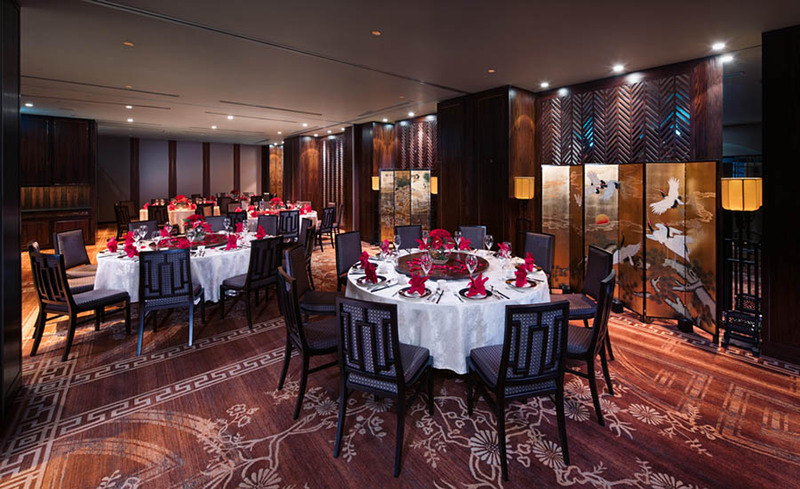 With menus that can be designed for groups of between 20 to 80 guests, the Cantonese dishes here are exquisitely crafted and expertly executed, and come with auspicious names to boot. 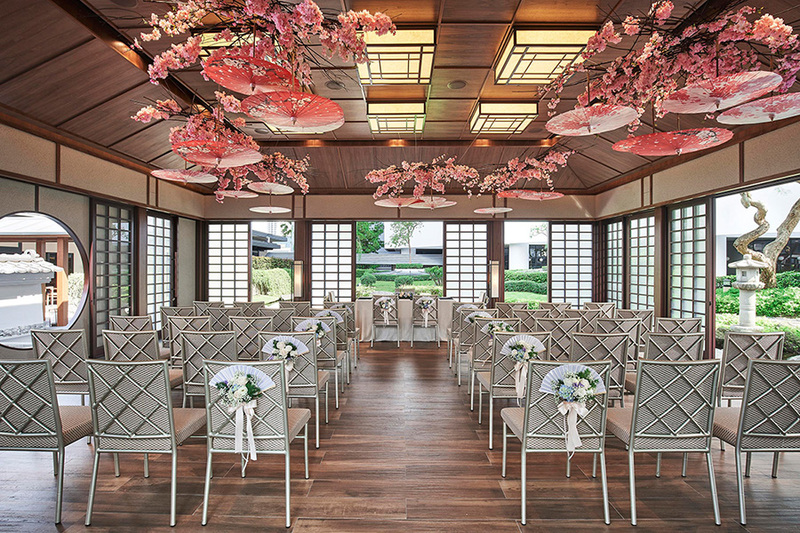 The restaurant’s alluring Oriental décor creates a lush and indulgent wedding experience. 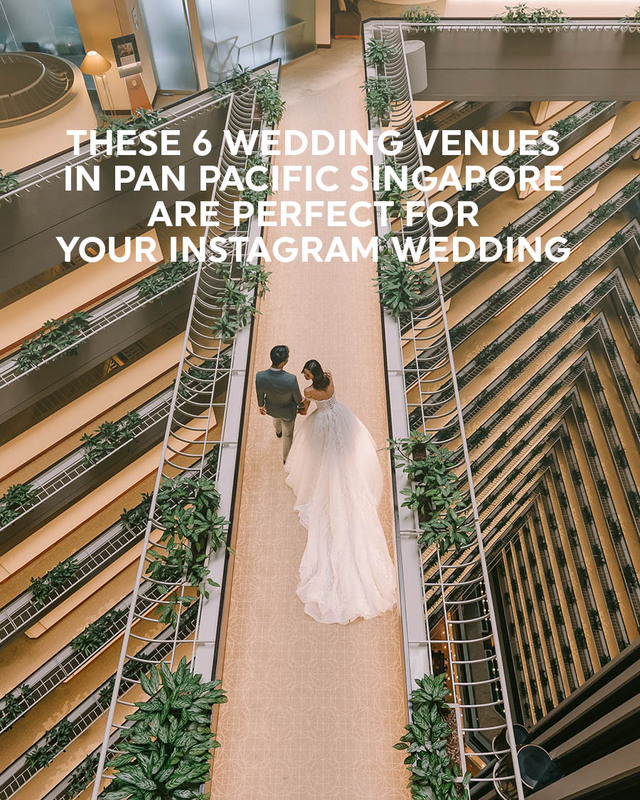 There you have it Wedding Scoopers, we hope that these venues at Pan Pacific Singapore have given you some Instagram-worthy ideas for your wedding! 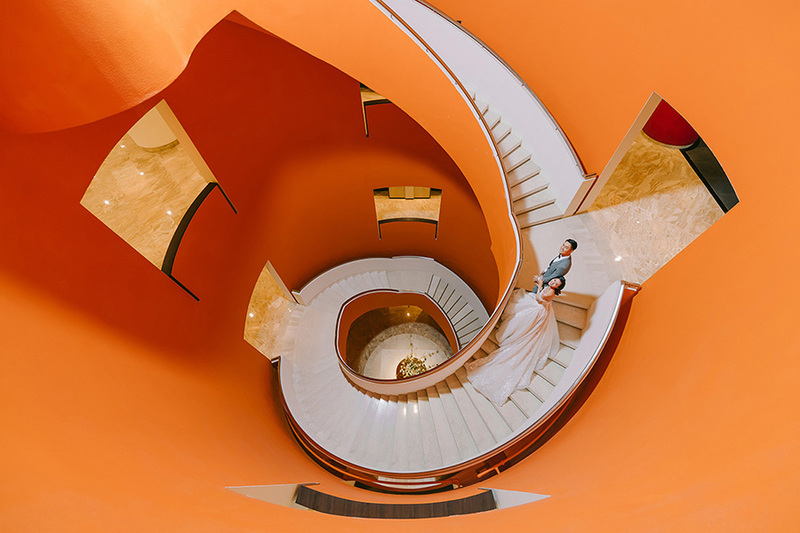 Keen to view these venues in person? 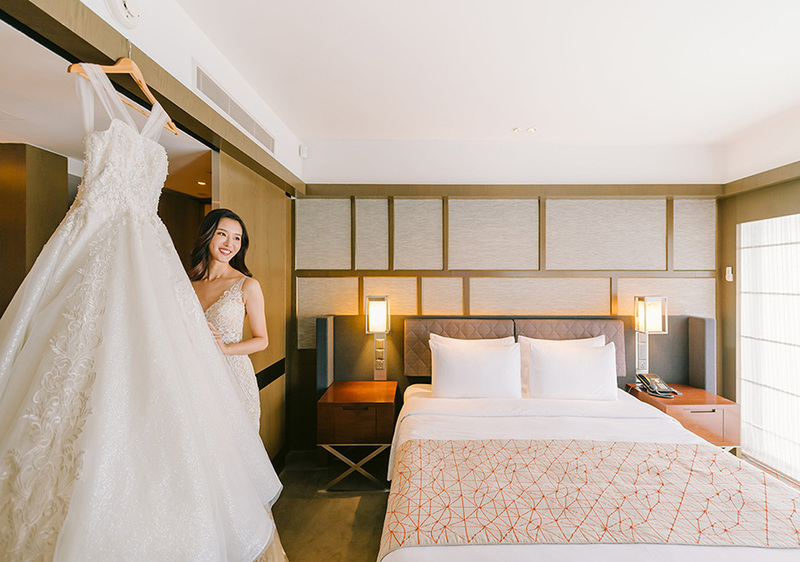 Mark your calendars for Pan Pacific’s Dream a Dream Wedding Showcase on Saturday, 27 April 2019 from 11am to 4pm at the Pacific Ballroom, Level 1. 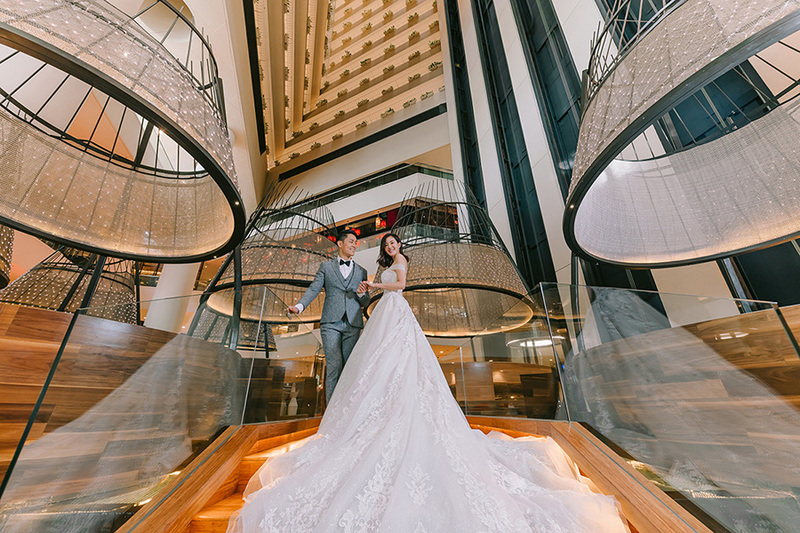 Get a glimpse of three new wedding themes by the hotel, visit other wedding vendors, and score exclusive privileges when you book your wedding banquet on the same day! Enjoy complimentary admission to the showcase. 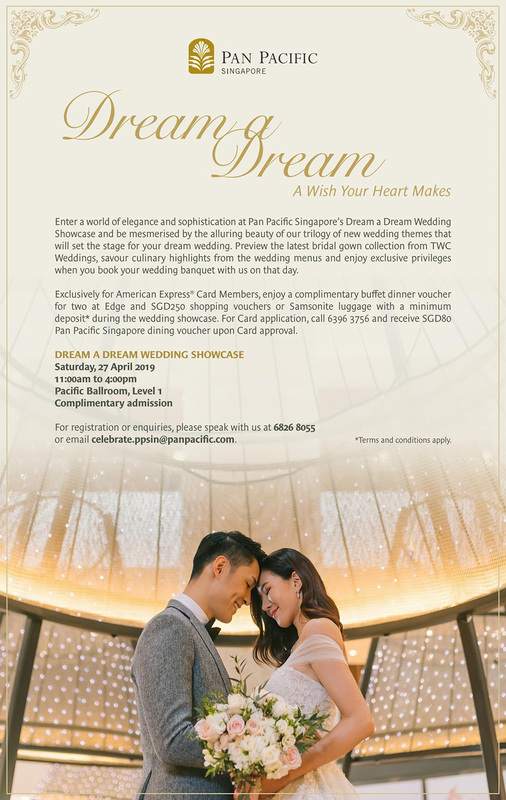 Register or enquire at 6826 8055 or email celebrate.ppsin@panpacific.com. * Terms & Conditions apply. 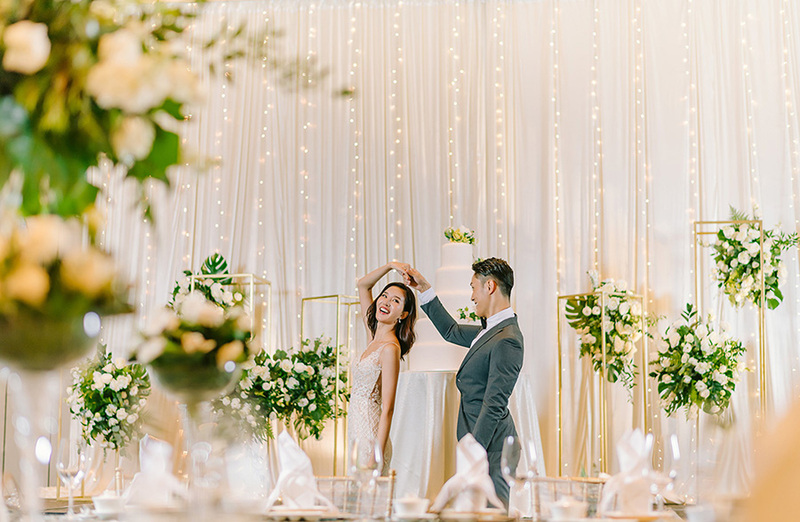 Applicable cards refer to American Express® Cards issued in Singapore by American Express International Inc. excluding American Express Corporate Card and American Express Cards issued by DBS Bank Limited, United Overseas Bank Limited, or Citibank Singapore Limited.